Coming off a solid first two weeks of the year, investors head into the thick of corporate earnings season. Some of the world's largest banks will provide a snapshot of the global economy they help finance, when they report results from the last three months of the year. Bank of America (BAC), JPMorgan Chase (JPM), Citigroup (C), Goldman Sachs (GS) and Morgan Stanley (MS) are all on tap to report. The financial sector is expected to be a standout in what has been a lackluster quarter for earnings growth. Banks likely got a boost from Americans rushing to refinance their mortgages, locking in low interest rates. S&P 500 companies are expected to report overall earnings growth of 2.4% for the last three months of 2012, according to FactSet Research. That's better than the 1% decline in the third quarter. Excluding the financial sector, earnings growth for S&P 500 companies is estimated to be just 0.2%. Beyond the banks, eBay (EBAY), Intel (INTC), American Express (AXP), UnitedHealth Group (UNH) and General Electric (GE) are also set to report earnings throughout the week. Investors will also have several key economic numbers to digest. Retail sales and consumer sentiment will be released throughout the week. They and will show whether last month's fiscal cliff fears weighed on consumer confidence and spending during the holiday season. Manufacturing data will also be in play, with reports on business inventories, empire state manufacturing and producer prices set to come out. U.S. manufacturing had fluctuated throughout 2012, but activity rebounded in December, according to the Institute of Supply Management. The December expansion marked only the third time the sector grew in the last seven months. Several reports on the broader state of the U.S. economy are also due out this week, including one from the Philadelphia Federal Reserve, the Federal Reserve's beige book and the state unemployment report. Last week, markets logged their second positive performance in a row. 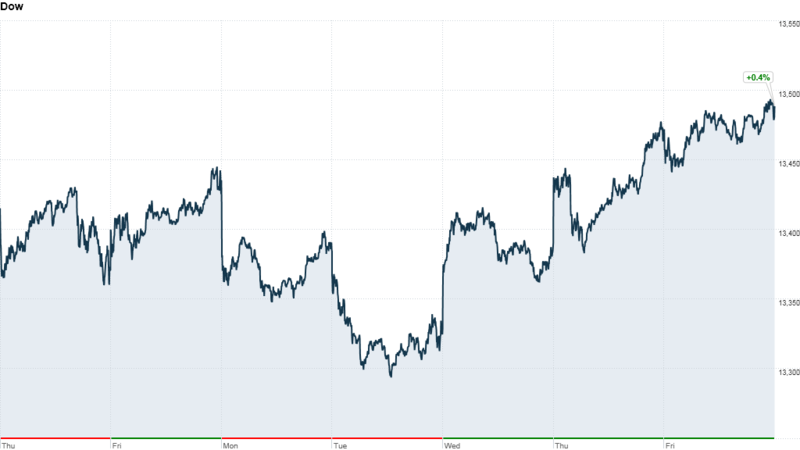 The Dow Jones Industrial Average and S&P 500 added 0.4% for the week, while the Nasdaq rose 0.8%.